The extreme pressure and high heat common to braking can push conventional brake fluid beyond its boiling point, causing it to vaporize, or boil-off. Even more problematic, water contamination can drop the boiling point of conventional fluid below safe standards, accelerating the rate at which it boils off. This leads to a spongy or unresponsive feeling in the brake pedal. In contrast, the unique chemistry behind AMSOIL Synthetic Brake Fluids increase their boiling point temperatures well beyond Department of Transportation (DOT) standards even when contaminated with 3.7 percent water (see chart). They maintain a stable viscosity over a wide temperature range and flow easily at the high pressures generated in today's automotive brake systems to deliver consistent, safe braking. 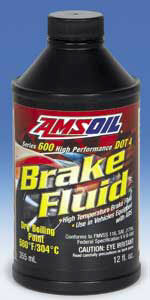 AMSOIL Series 600 DOT 4 Synthetic Racing Brake Fluid features a wet equilibrium reflux boiling point (Wet ERBP) nearly 100°F higher than the DOT minimum, making it ideal for high-performance cars, motorcycles and vehicles used for towing. Consult the AMSOIL Online Product Applications Guide for application information. For powersports applications, consult the owner’s manual to determine the correct DOT classification.